Last weekend I was searching for Tamil brahmins recipes in some blogs and websites, I found arachuvitta sambar and urulaikilangu curry ( potato curry) as the simple sunday lunch menu mentioned by many of them. So I prepared the same at home for our lunch. Actually my MOM & MIL makes a similar kind of idli sambar. Keeping that recipe in my mind , I prepared this araichuvitta sambar for lunch. One of my brahmin friends told me about this recipe long back which I noted down in my diary. By referring that recipe and the other recipes which I came across , I prepared this sambar. It was too good , fresh and flavourful. We loved it a lot. My friend told this sambar is usually made with small onions. I used drumstick and sambar onions. Do try this version for your sunday lunch & let me know friends ! Coriander leaves – few chopped finely. Pressure cook toor dal adding turmeric powder , hing and a drop of oil. In a kadai , add 2 tsp of oil and roast all the ingredients given under “ to roast n grind” in the same order. Make sure nothing gets burnt..Roast under medium flame till nice aroma rises. Add grated coconut at the end , mix well and switch off the flame.It will get roasted in that heat itself. Grind to a paste in a mixie.Set aside. After it is sautéed , add the tamarind extract , drumstick pieces , turmeric powder & salt..Add some raw curry leaves & a pinch of hing when it boils. Cover & cook till the drumstick is done. Now open the pressure cooked dal and mash it well..It should be well mashed.After adding the dal, add the freshly ground paste . Mix well without forming lumps.Let it boil for few minutes. Sambar thickens. So add more water if necessary.Check for salt..
Last but not the least , temper all the ingredients given under “ to temper” in ghee & add to sambar. Cover it with a lid to retain the aroma. Serve after 15 – 30 mins.. Enjoy with rice , potato curry and papad !! Note : You can use vegetables like chow chow, radish, brinjal, potato, carrot, beans, turnip to make this sambar. You can also make it with small onions alone which is known as Vengaya arachuvitta sambar. Some people add 2 small onions while sauting the masala. But I din't use it. Please check this link for Brahmin style potato curry recipe. Chopped tomato can be used along with onions.Saute it till its mushy and then add tamarind extract. Instead of adding the spices along with dal ,u can saute the ground spices before adding tamarind extract which gives additional flavour. Adjust the red chillies according to ur taste ..
Dal should be mashed well. U can also use vegetables like carrots, potatoes, chow chow, brinjal along with drumstick. Do try this and let me know ur comments..Catch u all in my next post ..
your first picture shows that u have done it exactly :) loved it ! they look so traditional.. with tiny chilli flakes.. love it..
Looks delicious and yummy ! Araichuvitta sambar is always so fragrant and special... looks great! 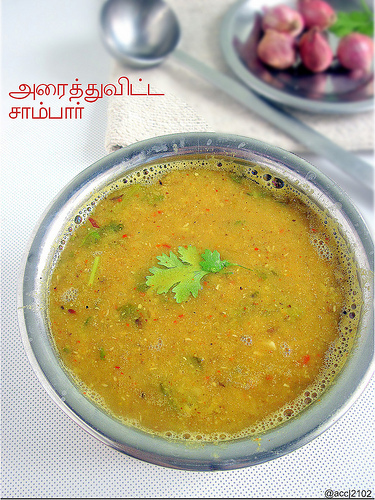 Super delicious and flavourful sambhar, wish to have it for my today's lunch. Love this sambar. The freshly ground spices add such flavour to the dish. You have made it so well. I make a very similar tiffin sambar! Mouthwatering sambhar!!! I love this tamil version of sambhar..very flavorful.. Thanks! Tried and it came out very tasty. Chitra, tried your arachivita sambar. I reduced vendhayam quantity to avoid bitterness. I added one tomato. It's better to add tomato and reduce tamarind quantity for health reasons ( my opinion). I thaalichufied at the beginning instead of doing separately. This is always better. One suggestion if you add tamarind after cooking the veggies it will help in faster cooking of them. The taste was very nice. Thank you. Hi as it is arachu vitha sambar avoid sambar powder. And make paste of all the roasted ingridients instead of making a powder. While roasting add urad dal and 2 small onions and avoid rice. Thank u sir for the suggestion.I will try n update this post.